Some memories of events just can’t remain in one’s head. It happened in 1999. It was a fun day out picking antiques, something I usually did alone when I wasn’t fossil diving. My then wife happened to be with me that day as we had a part time clerk Ginny, who would hold down the fort and mind our store. I had many picking routes in those days. Some in Sarasota, one that took me out to Arcadia, and one that took me down to Port Charlotte. We did the Port Charlotte run that day and were heading back up US 41, still south of Venice when I spotted a sign on a small storefront in a little eyesore of a stripmall. Consignments: Wanted and Sold, the cardboard sign in the window read. I also noticed at the same time the permanent sign above: Vacuum Cleaner Repairs. How interesting and strange. Needful Things? Like doomed characters in a Stephen King novel, how could we resist? One half of the store was devoted to vacuum cleaners, both used and new, and was littered with scattered parts. The other side had ugly gray painted metal utility shelves one would see in a garage, doing no asthetic favors to anything displayed on them. Most of the items were common and nothing of real interest. Apparently, the vacuum repair business was slow. The owner had the ingenius idea that the housewives who brought in vacuums to be fixed might have things to sell and he could get a percentage. Not a bad idea when you think about it. Then I saw it. A thick, large, flint glass decanter in a most unusual yellow color. As a bottle collector, I just had to give it a look see. I picked it up. It was very heavy and the stopper was missing. The base had a polished out pontil mark and the pattern was absolutely beautiful, like nothing I had ever seen. The base rim had age old foot wear and the sticker read an oddball price of $28.00. No. It’s missing it’s stopper, who’s going to want it? But it’s old and it’s good. I’m getting it, I know it’s good. No, but I know it’s good and I’m getting it anyway. The store owner wouldn’t budge on the price to an even twenty when I asked. I was expecting to pay twenty five. He was a firm seller, but did knock off two bucks and I paid $26.00 even. The feeling I got acquiring it helped me overcome the silent treatment I endured for the drive back to our store. I should have researched the decanter first thing, but didn’t. I had all kinds of glass pattern books, but I was easily distracted by so many other things at the time. I put a price of $150.00 on the decanter and set it on a shelf just before we closed the store for the day. I knew we’d make a profit, but now that the decanter was in our store, I had no idea what the mystery yellow decanter had in store for me. The next day found me alone in the store, minding things, when a large, stocky man came in. He browsed for a moment, then he saw the decanter and walked straight to it and picked it up. A hundred and fifty bucks? It’s missing it’s stopper. He didn’t even give me time to respond before he literally slammed down my decanter. I asked him to leave my store least he break something. He did so, in a huffy fast walk out the door. I walked over to the decanter, making sure it was uncracked and unchipped and looked at it again. This needs to go into a window display where it could be seen and not immediately touched. I spent the next couple of hours creating an antique glass theme window display with the decanter sitting front and center on white lace. It sat there for a month. Everyone strolling the sidewalk saw it day or night. 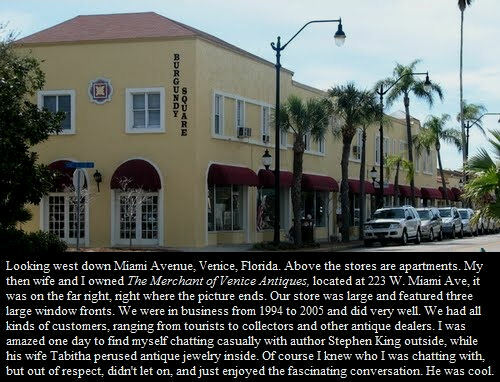 Our store was on a street that was mostly all antique stores and a couple of thrift shops. (No competition, but power in numbers, creating a draw for antiquers to spend the day as we all had different things.) Every shop owner and dealer in town and countless other folks saw that decanter sitting in the window. I received compliments on how beautiful or unusual it was. One rainy Saturday, right about closing time, I took the decanter out of the window, and got out my copy of Ruth Webb Lee’s Early American Pattern Glass. Only a couple of pages in, there was the pattern. Horn of Plenty, Boston & Sandwich c1860. Scarce in color. There were no price listings as it was a historical glass book. I went on eBay and couldn’t find anything in that pattern listed. I took the decanter outside and placed it on a wooden covered top of an encased trash can and shot a lazy picture of it in the rain against parked cars. I then listed it on eBay with a $150.00 reserve. That night it was bid up to $600.00. In the next couple of days it went to $1200.00. It rode at twelve hundered for most of the seven day auction listing and the next Saturday I was very excited as were all of the shop owners on my street who had seen it and knew I had listed it online. Now, they were all wishing they had bought it for $150.00. 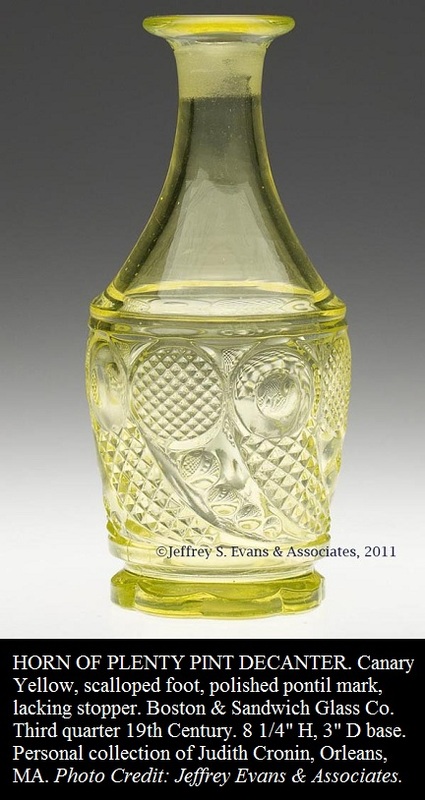 In the final second of the auction my $26.00 yellow decanter hammered down at three thousand, eight hundred and seven dollars and two cents. And the buyer? Her name was familiar. She was listed in the book I looked the pattern up in as the the owner of the copyrights to the late Ruth Webb Lee’s Early American Pattern Glass. Judith Cronin of Orleans, Massachussetts. My decanter found a great home in a very serious collection very close to where it was made. I’ll always know where it is.